Ikea adopted AR very early and made a good name with it. Their app Ikea Place allows buyers to make virtual placements of any furniture they like or are thinking of buying. They can make use of features like size, color, and anything else that interests them. It has an accuracy of 98% making it very profitable and also increasing customer’s confidence in the brand. The paint brand also benefited a lot with early adoption of AR. Their app Dulux Visualizer changes the walls at your home to any color you like by just tapping the color on them. It also includes a camera function so the consumer can take a photo and send it to anyone they like for a second opinion. This one is a huge plus for online shoppers. the app Dressing Room by Gap provides a detailed and extensive dressing room opportunity from the comfort of home. The consumer adds details about their dimensions and try out clothes virtually, before adding to the cart. Amazon came up with AR View which allows the consumer to browse through the products and virtually view them in their own house. This gives the online shoppers a sense of connection to the brand before they pay for the items. A step further into AR, Converse allows the users to virtually try out their shoes before buying. The user can position their foot in front of the camera after which the shoe fits on. They can take a snap and share it with their family or friends for a second opinion. This feature, however, is no longer a part of their app. This brand focuses more on building a brand-customer relationship rather than increasing their sales. They use Apple’s ARKit to interact with their followers and provide them with a virtual experience. The user can add Burberry-inspired borders, effects, and drawings to their photos for social media. It helps them to create a look book instead of making it about their sales. Cosmetic brands have a lot of advantages in their pocket with AR. Sephora’s Virtual Artist allow the users to test their products at home before adding them in the cart. It is fun, interactive and builds customer confidence as well as a good brand-customer relationship. This stationary brand is more targeted towards children with a very entertaining, learning and creative AR app. The app Drawybook is more in a gamification mode in which children can read, play games or apply their creativity in coloring and drawing. Measured by Lowe’s provides an Ikea-like experience with the app but it also extends outside the house. It allows the user to take measurements through their mobile phone camera and place furniture where they like. It also provides a 3D version of the furniture that the user can modify and position anywhere they want at their home. Perfect for online shoppers! The app allows the user to try on different glasses on their phones which helps them decide which one to buy based on the look. It also gives a camera feature so the user can take a snap and share with their friends for feedback. 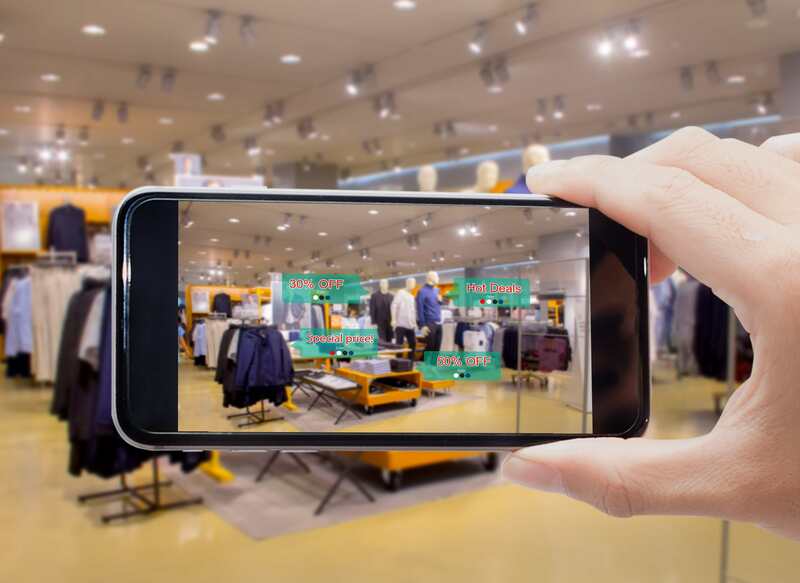 AR is the next big thing and every retail brand is climbing their way up to add features that can give them customer loyalty and sale increase. The race to future is on and everyone should be taking advantage of it for better business opportunities!